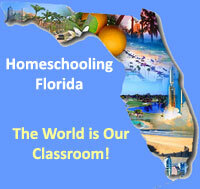 What You Need to Know for Homeschooling in Florida! This site is designed to provide all the information you need to get started, continue, progress, and complete homeschooling students in the state of Florida. We are to give you the homeschool help you need. Please give us your suggestions, opinions, requests, etc. Click Contact at the top of page here. Here you will find the FL State Statutes that govern home education in Florida, and information on fulfilling the FL state requirements for maintaining a portfolio, annual educational evaluation, standardized testing, as well as high school graduation requirements in the state of Florida. Other items of interest here include homeschool support groups by county, county home education office contacts, sources for homeschool curriculum, events of interest to homeschooling families, and much more!